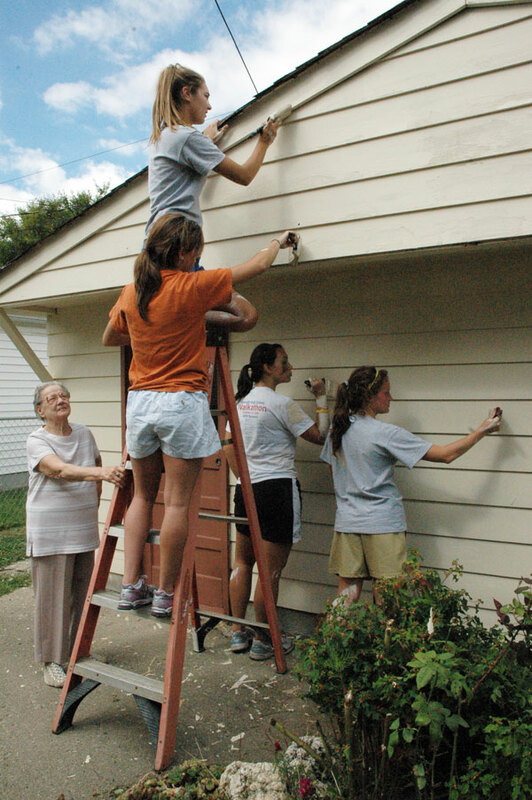 Pansy Mitchell smiled as she watched 15 members of Roncalli High School’s varsity volleyball team scrape and then paint the peeling wood siding on her old garage. Mitchell, who is 89, has lived in her modest Victorian house on Regent Street south of downtown Indianapolis for 62 years. This painting project on Sept. 27 marked the first time that Angels from the Heart volunteers from throughout the city had helped her with home maintenance during Sacred Heart of Jesus Parish’s annual community service program for low-income neighborhood residents. While the teenagers painted the garage, Mitchell said, she enjoyed listening to the girls talk, laugh and sing a variety of songs. Health problems limit her mobility now, she said, and she could not afford to hire someone to paint the garage. Roncalli seniors Katelyn Dawson, Ashley Holmes and Jordan Sudzina, all members of St. Barnabas Parish in Indianapolis, said the team enjoyed helping with the Angels from the Heart program for the first time. Ashley said this volunteer project was “a good bonding experience” for team members, who practiced that morning to prepare for the Marion County girls’ volleyball tournament before painting Mitchell’s garage. Roncalli’s varsity volleyball team members were among 450 Indianapolis area volunteers who helped with the ninth annual Angels from the Heart program. John Heinzelman, a St. Jude parishioner who serves on the Angels from the Heart organizing committee, said two Roncalli religion teachers, Gerard Striby and Sean Winningham, were instrumental in getting so many Roncalli students to participate in the volunteer project. Heinzelman said his family is from Sacred Heart of Jesus Parish and he enjoys coming back to his old neighborhood to help the residents.